I have to say that I'm actually pretty good at arts and crafts. I learnt to paint instinctively, based on my own observations and practice. So of course I had high hopes for my girl, hoping that one day we would spend afternoons painting together at home, the Botanical Gardens or even the beach. I even sent her for an art class for babies, just to get her an early head start. However, one day after she returned from school, my mum-in-law informed me that baby girl actually commented that she liked to paint. 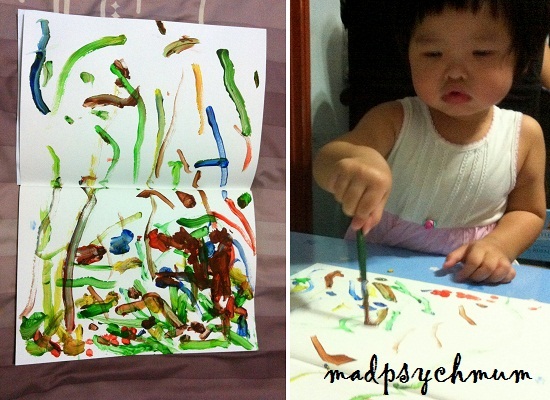 Her 1st ever painting she did solo! And then it hit me! She does like to paint. She just doesn't like to paint with her hands, she wants to do it with a brush! So I got her a brush, some paints meant for finger-painting (so that it cleans off easily and is safe for kids) and a sketchbook for easy storage of her art (you know I can't stand pieces of paper floating around right? ).